At first, sleeping with headphones may seem a bit strange. Isn’t something you would only do on accident? It’s like falling asleep with your glasses on isn’t it? Well, it can be. On the other hand, there are some benefits to sleeping with your phones on. As long as you follow some basic rules that is. You certainly don’t want to cause damage to your hearing, or wake up with painful ears. The key is learning how to sleep with headphones in a way that is safe and comfortable. This is an irritation of your outer ear canal. This mostly happens to people who wear the kind of headphones that can block the ear canals. The biggest concern here is if the irritation leads to infection. This would need to be treated with antibiotics or other medication. Now the good news. You can nearly eliminate this risk. Just avoid wearing ear bud style headphones to bed, and engage in basic hygiene by cleaning your ears and wiping down your headphones. If you start to feel some irritation, take a night or two off. Another small risk is that irritation could cause an excess production of earwax. While this is uncomfortable and a bit bothersome. It’s not really dangerous, unless so much builds up that it causes pressure or temporary hearing difficulties. Still, this is the kind of problem that should be quite noticeable before it needs serious intervention. Again, good hygiene and awareness is key. So is avoiding ear buds. Have you ever spent a summer night in a home without air conditioning? 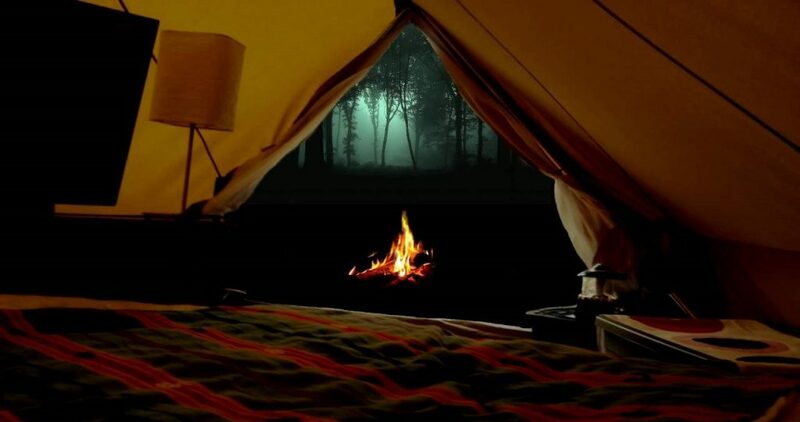 Maybe it was a trip to visit an elderly relative, or a night at summer camp? If you have, you know exactly how miserable it can be. The sweating leaves you clinging to your sheets, and it’s impossible to get comfortable…or is it? While there’s no substitute for good, old-fashioned air conditioning, there are other ways to cool down a room. In fact, we’ve got a great collection of tips for doing just that! 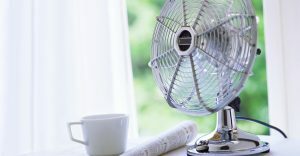 If you’re AC is ever on the fritz, or you just want to lower your summer cooling bills, give these a try. You know that trick where you throw your covers in the dryer to warm them up in the winter? You can do the same thing with your sumer sheets. Just throw them in a grocery bag and toss them in the freezer for a couple of hours. The effect doesn’t last very long, but the cooling can definitely help you to fall asleep. Unfortunately, those old box fans really aren’t that efficient at beating the heat on their own. Instead of relying on them to cool you down, point them out the windows. This will force the warmer air out, and improve air flow and quality. This is not the time to sleep in a full night set. Instead, try out a baggy pair of shorts and an oversize t-shirt. The last thing you want is warm, tight pajamas that bind and twist. Of course, the other option is to sleep in the buff. Some are all for this idea, but others think it tends to leave you sweaty with nothing to wick away the moisture. If you do use fans, remember there is strength in numbers. Position them across the room from one another. This will give you the benefit of having a breeze coming from more than one direction. CES 2019 wrapped up in early January. The bad news is that if you missed it, you missed out on a lot of cool technology. If you’re particularly excited about sleep technology, this was a great year to be in attendance. As always, the Las Vegas based show was super busy from day one on. There was plenty of innovation, and lots of emerging tech trends to see. Don’t worry, we’re going to start this piece with a bit of a retrospective on CES 2019, and we’ll focus completely on sleep related technology. This years show was full of of really cool stuff from all over the world. There were exhibits from Korea, China, and across Europe. This was in spite of concerns that trade concerns would keep exhibitors from some nations home. EEG devices that are used to monitor brain activity to provide better insights about your sleep than many of the sleep trackers that are available today. Fewer sleep trackers that provide mediocre metrics without much in the way of suggestions for real improvement. Hupnos Snoring Mask that is designed to reduce snoring thanks to EPAP. It uses vibrations to encourage snorers to change position, and increase the pressure required on exhale to help decrease snoring. Ooler Bed Cooling System. If you remember the old Kryo Sleep Performance System, this one is worth a second look. It contains a water-based cooler, mattress cover, and hydro layer. The whole system is just 599 for a single bed, and 1299 for a double. Urgonight EEG Headband – This is one of those EEG solutions. Wearers can actually learn to sleep better thanks to its EEG sensors. Users engage in EEG biofeedback therapy for about an hour per week. If you search YouTube for binaural videos, you’ll find hours of music, usually accompanied by trippy videos claiming that you’ll align your chakras, open your third eye, and access your lucid dreaming capabilities. Also, you’ll get better sleep. It turns out that there’s some data backing that last point up. There’s a lot of recent buzz around the benefits to listening to binaural beats while sleeping. Many believe it can improve sleep, reduce stress, even improve your cognitive function. In a way, that shouldn’t come as a surprise. People have been using sounds in different ways to improve their sleep forever. Some listen to ASMR, others use relaxation tapes, then there are the ever popular white noise machines and apps. 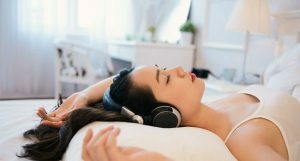 The right sounds can help you relax, and turn off persistent thoughts that are so infamous for keeping many of awake at night. 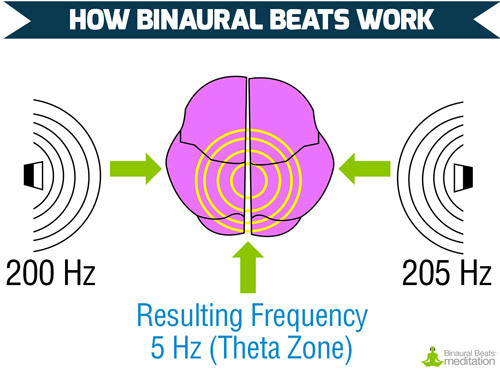 What Are Binaural Beats And How do They Work? Binaural combines two things Bi which means two and aural which refers to sound. It taps into your brain to help you obtain higher level of relaxation, and ultimately better sleep. The idea behind binaural beats is that two very similar sounds are combined, and that your brain takes those sounds and creates a new one. This new tone is the difference between the two different frequencies that you’re hearing. In order for binaural beats to have their intended effect, you have to wear headphones. That way the two different tones are delivered properly, one to each ear. While it isn’t necessary, most binaural beats recordings also include relaxing music or other sounds. In fact, those are the only sounds you will actually hear. The tones produced by binaural beats are actually at too low of a frequency for you to perceive. In spite of this, you are still being impacted by your exposure. People use binaural beats for sleep because it slows brain waves leading to relaxation. It reduces anxiety too. That can lead to longer, deeper sleep that is more restful. Can You Hack Your Sleep? First, a quick explanation of biohacking. Here, we are referring to the philosophy of viewing your body as a system, and ‘hacking’ that system to get the highest level of performance possible using science. There are several ways that you can engage in this form of biohacking. Some of the most common involve nutrition, physical fitness, and sleep. Here, we’re going to address the latter. Sleep is undoubtedly one of the most important things we do. Without quality, restorative sleep, we simply cannot function. It only makes sense to target sleep in any effort to improve your overall well being. Whether you have difficulty falling asleep, wake too often, suffer from a sleep disorder, or simply don’t feel rested, keep reading. These biohacks can help you get the most out of your sleep. A cooler room temperature can lead to better sleep. Ideally, this is between 60 and 67 degrees fahrenheit, certainly no more than 70 degrees. Lowering your bodies temperature helps signal that it’s time to fall asleep. In fact, if you’re interested in biohacking insomnia, start with this tip. Many sufferers report better sleep after cooling things down. Of course, this makes sense. Have you ever experienced the misery of sleeping in an unairconditioned room in the summer? If you have trouble adjusting to a colder room, don’t turn up the thermostat. Instead, grab an extra blanket. Of course, you may find yourself kicking it off late at night. There is one way that heat can improve sleep. Spend some time in a hot tub, sauna, bath, or shower a couple of hours before bedtime. By raising your body temperature then, you will cause it to lower as you get ready for bed. That temperature drop also signals your body to get ready for sleep. Cold room temps are great for sleep. Cold feet are not. Try wearing a pair of socks to sleep. You may sleep better throughout the night. Obstructive sleep apnea is a serious health condition that impacts millions of Americans. Not only does it cause disturbed sleep, it can lead to heart problems, type II diabetes, metabolic syndrome, and a host of other problems. Untreated, sleep apnea can be deadly. Until recently, there’s really been one treatment for sleep apnea, and that is positive away pressure therapy. Most patients receive this through the standard, ‘CPAP’ machines. Unfortunately, that’s not the best solution for every patient. Fortunately, there are some hopeful new treatments for sleep apnea. We’ll exam those, then review the more commonly available options. EPAP systems are deceptively simple. The user places two, disposable, adhesive valves over their nostrils when they go to sleep. As they breath in, the valves open. This helps airways to remain unobstructed. On exhale, the sleeper’s breath goes through small channels in each valve. This causes pressure that helps airways to remain open. This can lead to a reduction in obstructed breathing incidents, and fewer sleep disruptions. So far, research indicates that this treatment is being well-received. This is a new treatment that has only been FDA approved for a bit more than four years. Hypoglossal nerve stimulation involves the insertion of a device into the patient’s chest. 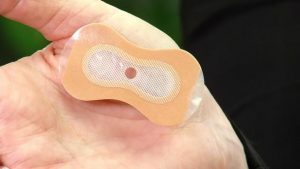 This device can be switched on and off by the patient. When it’s on (during sleep) the device monitors breathing. It also provides stimulation to the hypoglossal nerve. This nerve controls movements in the tongue that help to keep the airway open. The treatment seems to be promising so far. Patients are experiencing improved symptoms, reporting a small number of side effects, and complying with treatment protocols. This treatment is ideal for people with moderate to severe OSA. Oral pressure therapy uses a mouthpiece in combination with tubing and a small vacuum device. 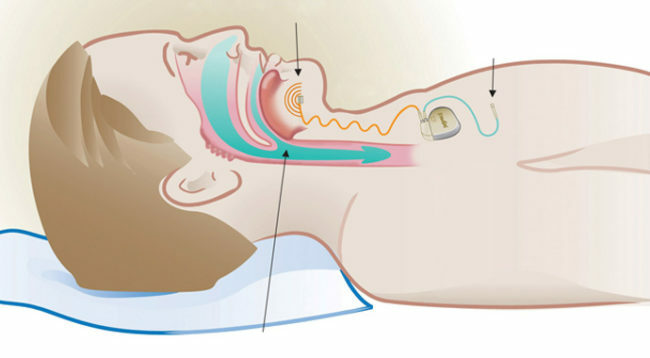 As the patient sleeps, the vacuum moves the tongue and soft palate into the ideal position for unobstructed breathing. 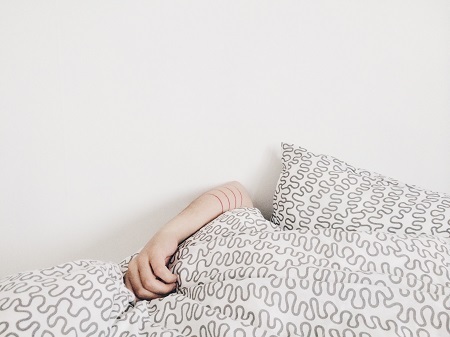 In the short term, a lack of adequate sleep can affect judgment, mood, ability to learn and retain information, and may increase the risk of serious accidents and injury. In the long term, chronic sleep deprivation may lead to a host of health problems including obesity, diabetes, cardiovascular disease, and even early mortality. This doesn’t mean that there is no hope for the habitual snorer because there is. It’s really just a matter of choosing the right snoring treatment. So, if you’re a habitual snorer or you’re stuck with one, then take a look at these options. To start with, you can consider some of these natural options. First of which is to lose some weight. In a study in the journal Sleep and Biological Rhythms, overweight people were nearly 50% more likely to develop snoring problems over a four-year follow-up than normal-weight participants. That’s because fat deposits in your upper airway can obstruct your breathing, says Men’s Health sleep advisor Dr Christopher Winter. Even if your little one is a superstar sleeper, you might be surprised one night to hear the sounds of singing or babbling over your baby monitor at 2:00 in the morning. It’s not nearly as concerning as crying, but it can still leave parents wondering what to do in order to get their little one back to sleep. In today’s video, I’ll explain why this always happens around the same age, and what to do when your little one suddenly starts breaking into song when she’s supposed to be asleep. The post My Toddler Keeps Playing When She Should Be Sleeping appeared first on The Sleep Sense Program by Dana Obleman. Children are grossly underdiagnosed for sleep-disordered breathing (SDB), which includes obstructive sleep apnea (OSA), and the symptoms may be wrongly attributed to behavior issues, according to research in the Journal of the American Osteopathic Association. Up to 15% of children have some form of sleep-disordered breathing. However, 90% go undiagnosed, often because symptoms are misattributed to psychological or emotional issues. “Children who have behavior problems or are suspected to have ADHD might actually be suffering from a chronic lack of restorative sleep,” says John White, DDS, study coauthor, in a release. Neurocognitive development, cellular regeneration, and tissue and bone growth all occur during the deep sleep stage. However, when breathing is obstructed in the upper airway, the brain switches back from deep to light sleep in order to resume normal breathing—barring the mind and body from critical restorative processes. Symptoms of SDB and OSA in children include snoring, restless sleep, excessive sleepiness, teeth grinding and jaw clenching, migraines, bedwetting, and irritability. If SDB is suspected, White says a referral to a multidisciplinary team is ideal. He suggests this includes a pediatric ENT (ear-nose throat specialist), sleep specialist, dentist trained in craniofacial development, and a myofunctional therapist. White says that dentists are often able to screen for the problem because it is rooted in dysfunctional craniofacial development, which begin early on. He explains that infants with tongue-tie or who have latching problems during breastfeeding might be at risk for developing SDB or OSA, as well as children who have speech delays. For children who are diagnosed with SDB or OSA, the first line of treatment is usually removing the child’s tonsils and adenoids, according to White. If SDB persists following surgery, dentists might employ an orthodontic maxillary expander. The device braces against the palate and top molars, with an adjustable bar bridging across the roof of the mouth. Parents turn a screw that extends the bridge one notch each week, over six to seven weeks.